This companion volume to Pass Grade 5 Theory was published due to consumer demand. This book can be used as a stand-alone theory course for those who only wish to study to the level of Associated Board Grade 3 theory examination. The author has extensive experience of teaching music theory both in schools and in private practice. This book is the product of that experience and the material in it has been used successfully with students of all ages from Year 6 to adult. It assumes no prior formal training in music theory. If, having completed this course, a student decides they would like to progress to Grade 5 level then Pass Grade 5 Theory will provide all that they need. Although inevitably some of the explanation is similar, exercises have not been duplicated. 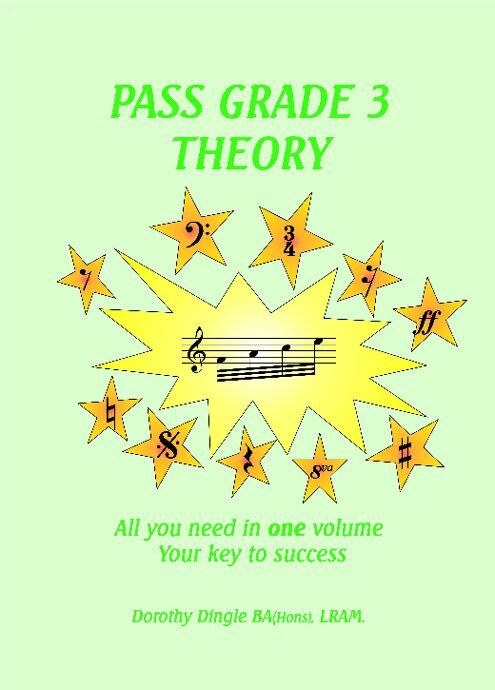 Consequently this volume also serves as a useful source of extra material to reinforce some of the basic concepts introduced in Pass Grade 5 Theory should a student require this. Note: you will automatically be taken to Chamberlain Music to make this purchase. Produced as a stand-alone intermediate theory course, this book provides a comprehensive introduction to the study of music theory. It is assumed that the student has not studied music theory before and each topic is covered in detail from first principles. Each musical term is defined as it is introduced. There are 10 Units in the book. The order has been carefully planned in order to ensure that the student gains a thorough understanding of the basics of pitch, key and rhythm. In Units 1 – 5 the only note-value used is a semibreve in order to reinforce the concept that the position of the note-head on the stave defines pitch. Unit 1: Pitch introduces the concepts of pitch, stave and treble and bass clefs. Unit 2: Major Scales and Key Signatures provides a detailed explanation with numerous written exercises. Unit 3: Minor Scales and Key Signatures describes both harmonic and melodic minor scales. Unit 4: Tonic Triads provides further opportunity for the student to secure their knowledge of keys in a different context. Unit 5: Intervals allows students to learn about some of the ways in which musicians talk about the relationship between two notes of different pitch. Unit 6: Note-lengths and Rests introduces basic note-values and their rests along with explanations of dotted and tied notes. This Unit also contains examples of the correct way to beam shorter note-values together. Unit 7: Time Signatures explores the concept of beat and the use of time signatures to indicate the beat within a piece of music. Both Simple and Compound Time are introduced, along with the triplet. Unit 8: Writing Rhythms shows students that note-groupings are designed to show each beat clearly. Exercises are provided in completing 4-bar rhythms and in rewriting melodies in notes of twice or half the value of the original. Unit 9: Transposition teaches the student how to rewrite a melody an octave higher or lower and into a different clef. Unit 10: General Questions provides a comprehensive list of the Italian terms and Performance Directions required at this grade. The terms and signs are not listed alphabetically but instead are grouped together with words of similar meaning in order to make them easier to learn. I found the “To Learn” signs very useful. They helped me to know exactly what I had to memorise. –L (age 12), Berks.